The question, "So, what do you think of the new iPhone?" was the common denominator in all of my meetings yesterday. It did not matter with whom I was meeting, a leadership coach, retired labor contract negotiator, a portrait artist, an adult-ed administrator, or a high school teacher. Each asked my opinion of Apple's newest addition to their "i" products - "a widescreen iPod with touch controls, a revolutionary mobile phone, and a breakthrough Internet communications device" [apple.com]. I was clear that I was considered an expert on all thing techie. The funny thing was that while I had seen references to the iPhone on in my feed aggregator, I had not actually read anything details. My lack of interest in iPhone has to due with the fact that I only occasionally use my cell phone and am certainly not tied to my PDA (which is way out of sych). I am not really interested in gadgets like others (he says while posting a blog at an outdoor cafe). But all of the interest in the iPhone has actually got me thinking. First, I must say, Apple is one cool company when it comes to marketing. They were able to generate great buzz in a product that I know none of those folks with whom I met yesterday will ever need. I am fascinated with how buzz is generated and Apple certainly has a good understanding how to spark interest in their products. How many folks do you know that think that there is only one MP3 player - the iPod? The second thing that got me thinking is how the iPhone or a similar device will be the norm in classrooms. The current version of the iPhone needs some refinement to meet the needs of educators (including a dramatic reduction in price! ), but it does give us a view into the future. Debates on 1:1 computing will be moot as everyone will have a handheld device for communication, research and collaboration. I see the iPhone as a wake up call for me to get more experience with mobile devices in education and visit classrooms where learning is being enhanced through the use of these gadgets. and tagged as gadgets. Currently, there are no comments. 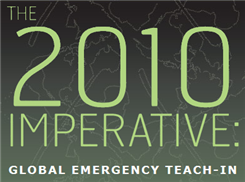 The 2010 Imperative is a "teach-in" event produced by Architecture 2030 addressing global warming and climate change. This 3 1/2 hour web-cast offers design students around the world to participate in a discussion in the role the design community has in the global warming crisis. I think this is a fantastic example of using online technology to discuss a global issue with folks around the world. While the target audience are design schools, professional design firms and governmental entities, there certainly is a place for high school students. Global warming is a great example of a multi-discipline issue giving students a chance to apply their knowledge is math, science, economics, history, etc. to a single problem. This is a wonderful opportunity for students to participate in a real-world issue. Begin discussing the issue of global warming and climate change having students research the subject. After a cursory bit of research to get a handle on the gist of the subject, students should be encouraged to find a particular aspect of the discussion on which they would like to focus through further research. They could then post their findings and opinions online a blog so that other students can learn from their research and join the discussion. Then have the students listen and participate in the web-cast as a group, discussing issues as they are presented and emailing questions / comments to the panel members. Finally, students could post to the blog their reflections on the event describing what they have learned from the web-cast specifically and the project in general. Global warming is an important issue, but this web-cast offers more than just a discussion on the topic. It give us an an opportunity to engage students in a real-world issue where they can become informed, offer their opinions and debate with people around the world. To register for this free event check out The 2001 Imperative website. and tagged as civics, webinar. Currently, there are no comments. I am a big fan of independent films and I will be posting from the Sundance Film Festival later this month. I noticed today on the Sundance Channels' site a link called called "Second Life Blog". What does the Sundance Channel have to do with a virtual reality "game"? Apparently, Sundance is creating an island in Second Life and as its first event will be screening the movie "Four Eyed Monsters" complete with a Q&A with the filmmakers. This is no game, this is an opportunity for us to "travel" to an exclusive event and interact with the folks that made the film. With the exception of "Mavis Beacon Teaches Typing" (another story altogether), I have never had much patience for those educational games that are little more than drill and practice with graphics. But the games described by David transport the student to a new environment where they are free to take risks, be creative, make mistakes, and learn. This is what innovation is all about. In a conversation with a friend that I just met (again, a story for another time), we were discussing the difference between incremental changes and breakthrough innovations in education. Gaming certainly offers the possibility of the latter. Now, can someone tell me how to get a Second Life so I can watch the movie. and tagged as gaming. Currently, there are 4 comments. Did you catch the "America 101" segment on NPR's Morning Edition? It was about a class that the University of California, Berkeley offers to its foreign post-grad students that helps them understand US culture. Many international students studying in the United States don't know when it's appropriate to say hello by giving a kiss on the cheek or using a handshake. Or what it is to "pig out" during dinner. Now, a University of California at Berkeley professor is offering a course to those students on how to decipher American culture. This story got me thinking about how difficult it is to be a diplomat or international business person. Do we expect others to behave as we Americans do when negotiating an international treaty or business deal with another country? I guess I never expected that I would need such cultural awareness as an educator. But these post are read by folks outside of North America. If I were to meet with my Scottish colleagues, should it be over a wee dram? I have been doing some research into ways of rating schools and game across the "Top Ten District Report Card" developed by Park City Education Foundation. The report card includes various metrics for measuring a school's success, but the one that really excited me relates to Foreign Language. To get an A, 70% or more of a school's seniors must complete at least three years of a foreign language. Well done! (And I am not just saying that to get in good with my wife who teaches Spanish) The study of a foreign language is much more than just congregating verbs. It is about culture and exposure to the idea that not everyone does things the way we do. I heard a saying recently "those in the West have all the watches, but we in Afghanistan have all the time" (again on NPR - though I can't find a link to it.) It was mentioned in the context of negotiations with the Taliban and partly referred to how the West's presence in Afghanistan is only temporary and the Taliban can wait us out. But it was also used in reference to the way negotiations were held. The talks were over tea and could be marathon ordeals. To be successful, as was indicated in the NPR piece, one must learn how to drink lots of tea. My brother-in-law travels the world, living in such diverse places as Bogota, Singapore, Buenos Aries, and Myanmar. I love to talk to him during his short stays in the US about the cultural differences. This is what he loves so much about traveling - experiencing the numerous ways to live your life. The Puritan work ethic may not be the only way. BTW - I lived in Edinburgh for a while so I can attest to the importance a good single malt plays in most conversations.